Join the Evanston Running Club (evanstonrunningclub.org)on March 26th at 6:30 pm for a relaxed, social evening for the North Shore running community. Monique Ryan, MS, RDN, LDN (www.moniqueryan.com) a Certified Specialist in Sports Dietetics is one one of the expert speakers and she will present on fueling and hydration for long runs. 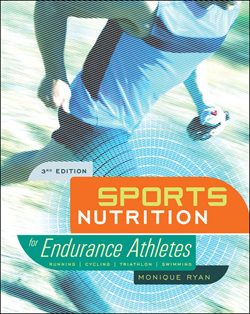 Copies of her book Sports Nutrition for Endurance Athletes (3rd edition) will be for sale at the mini expo. Other topics covered by expert speakers include training programs, the latest gear trends, injury prevention, cross training, mental toughness, and more… The venue is 27Live (www.27live.com) on Church St in Evanston, IL. To book your place contact Kevin@rundamentalists.com. As well as the educational content, Runapalooza will provide an opportunity to share running experiences and “war stories” with old and new friends.